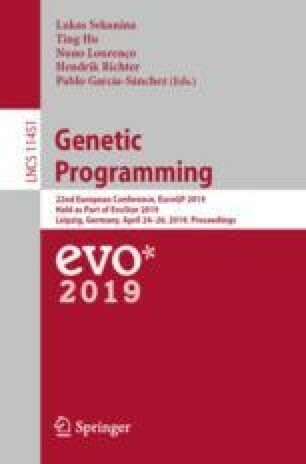 The genotype-to-phenotype mapping plays an essential role in the design of an evolutionary algorithm. Since variation occurs at the genotypic level but fitness is evaluated at the phenotypic level, this mapping determines how variations are effectively translated into quality improvements. We numerically study the redundant genotype-to-phenotype mapping of a simple Boolean linear genetic programming system. In particular, we investigate the resulting phenotypic network using tools of complex network analysis. The analysis yields a number of interesting statistics of this network, considered both as a directed as well as an undirected graph. We show by numerical simulation that less redundant phenotypes are more difficult to find as targets of a search than others that have much more genotypic abundance. We connect this observation with the fact that hard to find phenotypes tend to belong to small and almost isolated clusters in the phenotypic network. This research was supported by the Natural Sciences and Engineering Research Council (NSERC) of Canada Discovery Grant RGPIN-2016-04699 to T.H., and the Koza Endowment fund provided to W.B. by Michigan State University.